Only the best straw will suffice. the advent of spring rains. root or lovesong of a man. satisfy her own burning itches. But the most wondrous thing of all? Poet’s Notes: For me the ideal work of horror-- whether movie or print--starts out grounded in the mundane, then slowly ratchets up the tension, creep factor, or sinister angle, until finally full-bore terror or chaos erupts, and there's all hell to pay. Plus you should like the characters; otherwise there's little or no emotional connection, and you might as well be reading columns of statistics. In my opinion, it's exactly how much the baseline changes after this point, that compares and contrasts the heights and depths of before with after--what I call the brighter the light, the darker the shadow effect--that truly adds to the cathartic resonance of horror. "Witch's Broom," however, attempts the opposite tack. By starting out with a series of gruesome images, but then progressing toward the mundane, we're able to reflect on the witch's human side and therefore perhaps empathize with her a bit. Then again, readers familiar with my work know I almost always sympathize with the monster, no matter how heinous. Editor’s Note: I love the ending of this poem. 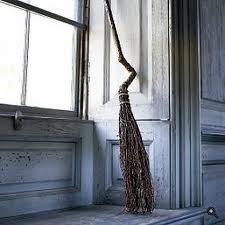 It is both ironic and humorous to think of a witch’s broom--especially one so elaborately ensorcelled--as performing the basic function of an ordinary broom. “Witch’s Broom” was first published in Goblin Fruit and reprinted in the April 2014 issue of Songs of Eretz Poetry E-zine.